Kalina is using Smore newsletters to spread the word online. Lacto Ovo Vegetarian do not consume any type of diary, meat, poultry or eggs. This is the strictest form of Vegetarians. Lacto Ovos gain the 6 essential nutrients through large portions of grains, vitamin supplements and fruits and vegetables. Ovo vegetarians allow the consumption of eggs but they don't eat milk, butter, or any other dairy products. Like all vegetarians, they do not consume meat. Ovo vegetarians get their nutrients from eggs, vegetables, fruits, and supplements. Vegans do not consume any product that comes from an animal. This includes eggs, milk, butter or any type of meat or poultry. Vegans get necessary vitamins from peanuts, organic peanut butter and vegetables and fruits. Vegetarians do not eat meat or poultry. Basically, they do not consume any product that is a living animal. 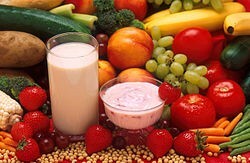 Vegetarians get nutrients from dairy products such as milk and eggs. They also get essential nutrients from vegetables. Find the Perks of Being a Vegetarian here!